My all-time favorite opening movie scene is from Indiana Jones and the Raiders of the Lost Ark. Featuring Indy navigating a trap-filled temple to find an ancient treasure, the suspenseful start set the tone for the entire Indiana Jones franchise. As viewers we were captivated by what dangers lay ahead, climaxing with the thrill of Indy finally getting his hands on the wondrous Golden Idol. The opening scene made us feel like we were there, discovering the treasure right along with Indy; our on-screen reward as movie goers. Because of its cinematic impact, the Golden Idol, or Chachapoyan Fertility Idol as it is officially called, went on to become a pop culture icon. Fertility Idol replicas exist, most coming out during the 2008 Indy collectibles explosion that occurred with the release of Indiana Jones and the Kingdom of the Crystal Skull (probably the best thing that came out of that movie). There’s a very nice and affordable ($20) vinyl bank produced by Diamond Select Toys, though it lacks the shiny gold appeal of the film’s idol. Sideshow Collectibles produced what is arguably the most screen-accurate Golden Idol, though it’s $190 price tag was more than most casual collectors wanted to pay. Now, many years past 2008’s Indy collectible renaissance and years before the now confirmed Indiana Jones 5 (2020), a new Fertility Idol replica has surfaced. Produced by Locoape, the collectible’s division of retailer Toynk Toys, the “Adventurer’s Treasure” hits that sweet spot of being both film accurate AND reasonably priced. 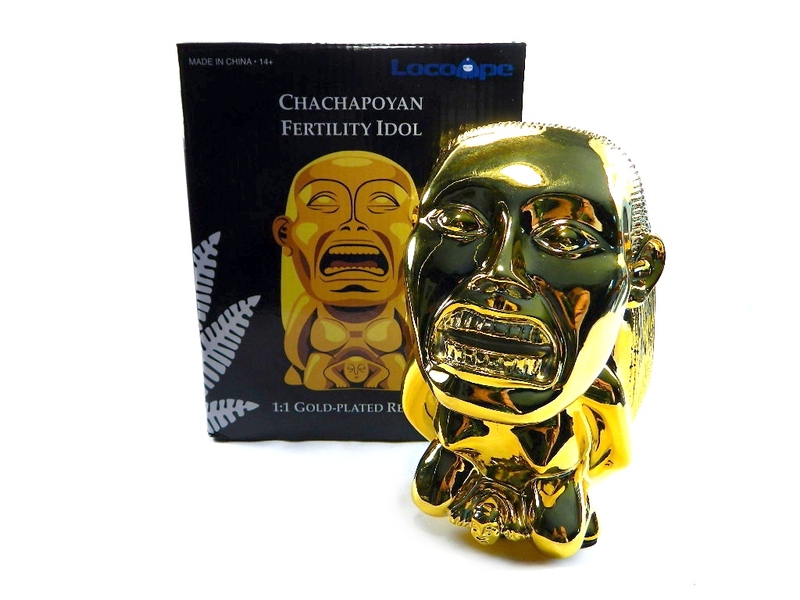 In-stock and available for order now HERE, the Chachapoyan Fertility Idol 1:1 Gold-Plated Replica retails for $77.99 with free standard shipping included in the price. First off, this is a non-licensed collectible. Since fertility idols have existed in history (perhaps not golden and looking exactly like this), licensing isn’t required. What licensing would get you is the rights to use the “Indiana Jones” brand name on the box, something Locoape obviously opted not to do. And that’s just fine. 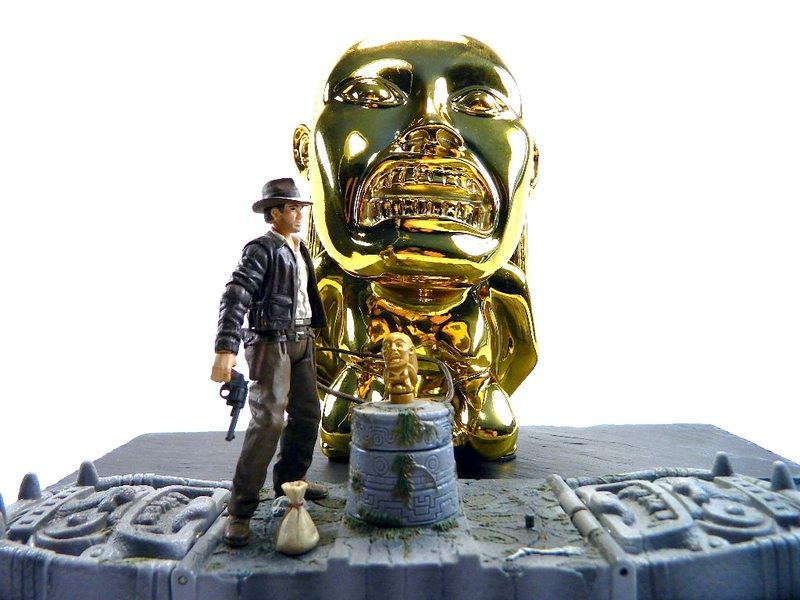 ANY Indy-loving fan will instantly recognize this replica for what it truly is: the Fertility Idol from Indiana-friggin’-Jones. Once removed from it’s protective Styrofoam prison (the irritating, crumbly type, but I’ll let it slide because this replica came out so nice), the Fertility Idol immediately impresses with a super shiny golden sheen. 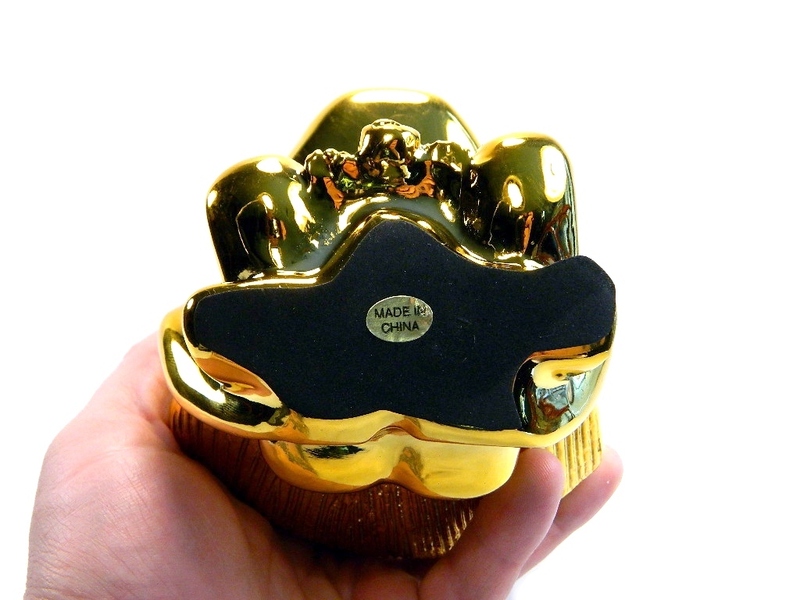 It’s not made of real gold, of course, but is “gold” vac-plated – a vacuum metallizing process that produces a brilliant decorative finish. The statue itself is made of a hefty solid polyresin. There’s nothing hollow or cheap about it. It would most likely shatter (or at least crack) if you dropped it on a hard surface, but it isn’t brittle by any means (how cool would a solid metal idol be?). 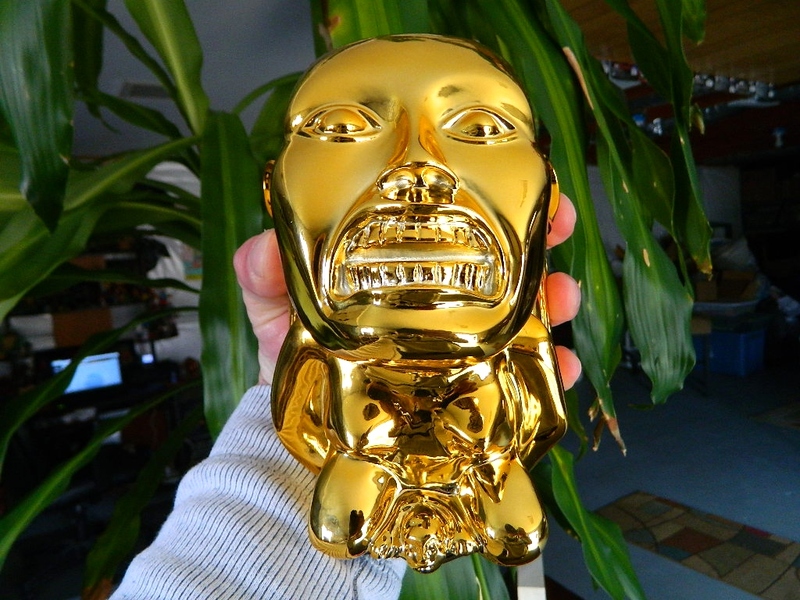 The Fertility Idol packs some weight, feeling like a real golden treasure when picked up. It’s also a robust piece, measuring 7-inches tall and fitting nicely in the palm of your hand. I’m not an expert on the dimensions of the original prop, but this replica sure looks and feels like the right size to me. 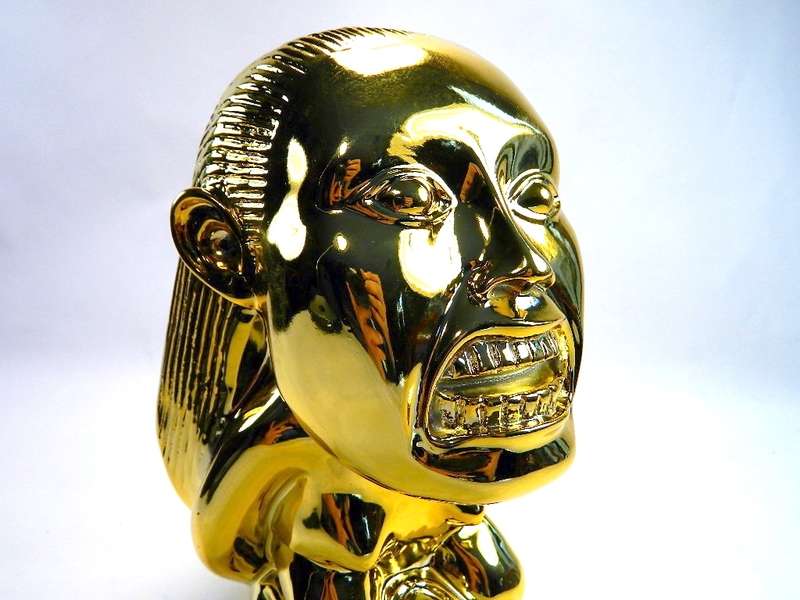 About the only small criticism I have with Locoape’s Fertility Idol replica is the base, or rather, lack of one. While the idol does stand on its own, its small felt-lined bottom combined with its top-heavy design makes me a little nervous. You’ll want a flat, solid surface to display this on, otherwise you risk it toppling forward. Including a small base that the statue could plug into would have been ideal, though I’m sure its addition would have driven up the cost (the stone pedestal that came with Sideshow’s idol was definitely reflected in its $190 price tag). 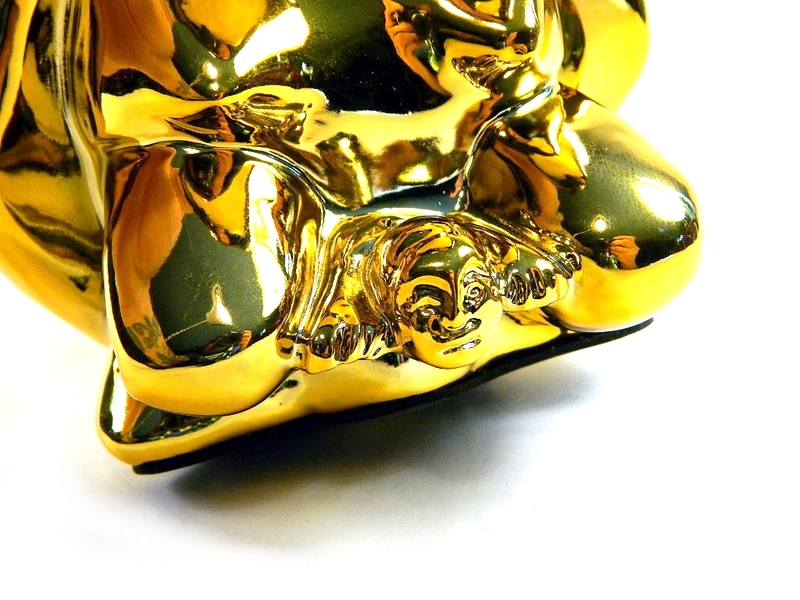 All said, Locoape’s Chachapoyan Fertility Idol 1:1 Gold-Plated Replica is a fantastic collectible and must-own piece for Indiana Jones fans. Totally unexpected on the market, yet totally appreciated, this statue has filled a long empty hole in my collection. I own the DST vinyl bank and a small metal idol replica from Gentle Giant (part of their SDCC 2008 “Artifact Crate” exclusive), but I never did have the cash for that nice and shiny Sideshow statue. 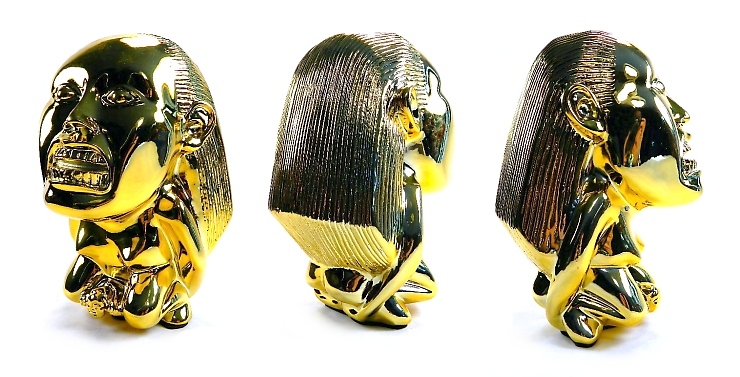 Retailing at $78, the price is right for Locoape’s Golden Idol. And the best part? You don’t have to survive a trap-filled temple to get one.